While many game-day recipes require frying and a lot of oil, we have cracked the code on how to make some of our game-day favorites in the oven for a healthier, less messy approach. t Next to Thanksgiving, I think the day of the big game is the biggest cooking day of the year. We all try to come up with fun snacks that the men will eat and the kids will love, and we want to be able to whip them up in time for kickoff. But making just one or two of them never seems to cut it. And then there’s the fact that so many game-day recipes require frying and oil, which aren’t healthy for anybody. t Below are seven traditional game-day recipes that we baked rather than fried. In the end, we saved time, cleanup and calories. Go team! t I used a 9 x 9-inch baking dish to make this simple jalapeno popper recipe in my oven. Mix the cream cheese and spices together in a large mixing bowl until smooth. Spoon the cream cheese mix into each jalapeno half. 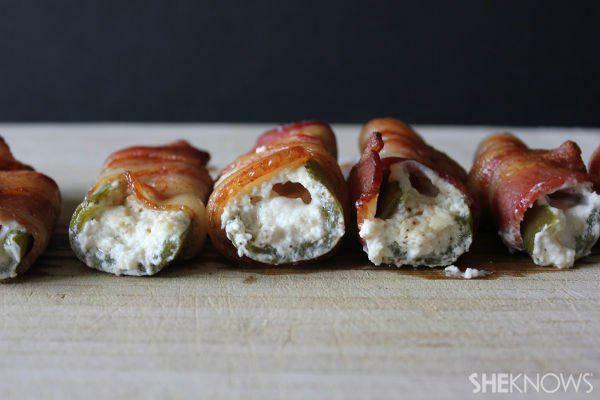 Wrap each jalapeno half with a slice of bacon. Lay the wrapped jalapenos faceup in the baking dish and bake for 30-40 minutes, or until the bacon is crisp. t This one requires a little more prep time to cook the chicken. I like to put my chicken breasts in a Dutch oven in the morning. That way, the shredded chicken is usually ready around lunchtime, 3-4 hours later. Add the chicken breasts, bourbon and 1 cup of barbecue sauce to a Dutch oven or a slow cooker and cook until the chicken is tender enough to shred. Allow the shredded chicken to absorb excess liquid, then toss in another cup of barbecue sauce. While the chicken is cooking, prepare your potatoes. Toss the potatoes in the olive oil, lay them out on a baking sheet and sprinkle them with the sea salt. Cook in the oven for 20-30 minutes or until the potatoes are tender. Remove the potatoes, cut them in half and scrape the inside of each potato skin out and into a large bowl. Mix the scraped potatoes with the shredded barbecue chicken breasts and butter. Add a spoonful of the barbecue chicken mixture into each potato skin. Top with shredded cheddar jack cheese and cook in the oven for another 10 minutes. t Fried pickles are amazing. They’re one of my favorite foods, but this lighter version makes for a healthier, grease-free version with the same crunch! Remove the pickle spears from the jar and lay them out on a paper towel. You want the spears to be dry so they will hold the batter better. Whisk the 2 eggs together in a bowl. On a plate, mix the breadcrumbs and spices together. Dip your pickle spears into the egg mixture, then roll them in the seasoned breadcrumbs. Lay the pickle spears on a baking sheet and bake them for 12-15 minutes, rotating them once at the 6-minute mark. t There are numerous versions of this recipe out there, but mine requires very few ingredients, and I guarantee your kids will love it. Hull each of your portobello mushrooms, removing the stems and forming a bowl. Lay 1 piece of pepperoni in each mushroom. Top that piece with about 1 tablespoon of shredded mozzarella cheese, then repeat. Sprinkle the dried Italian spices over the top of each stuffed mushroom. Bake for 20 minutes until the mushroom softens and the cheese begins to bubble. t If you’re looking for something the gals at the game will love, try these. If you bake your egg rolls rather than frying them, they come out much less greasy and just as delicious. Add 2 slices of avocado, two slivers of jalapeno pepper and a pinch of grated carrot with a sprinkling of salt to the center of each egg roll sheet. Fold the sheet per the instructions on the packet. Add the egg rolls to a baking sheet and brush the top of each one with a thin layer of olive oil. Bake for 20-30 minutes or until the egg roll wrapper is brown and crisp. t Corn fritters are popular as bar food in the Midwest, but they can be so heavy! By taking a simple corn fritter recipe and transferring it from the fryer to the oven, we’ve created a great snack that won’t weigh people down. In a bowl, combine all the dry ingredients: the flour, baking powder, cumin, salt, black pepper and garlic powder. In another bowl, whisk together the wet ingredients: the egg, milk and butter. Slowly pour the wet ingredients into the dry ingredients, whisking them together until a smooth batter forms. After you have drained your chopped green chilies, pat them dry with a paper towel and then add them to the batter. Do the same with your cooked corn kernels. Spray a cupcake tray with nonstick spray and then add a spoonful of the mix to each cup reservoir. Bake at 400 degrees F for 15-20 minutes until the muffins are brown and firm on top. t There are many methods of cooking chicken wings. A lot of people deep-fry them, while others boil and then bake them. Our method first puts frozen chicken wings in a slow cooker and then transfers them to the oven. Add the frozen chicken wings to the slow cooker with the beer and cook on high for 3-4 hours, until the chicken turns white. Transfer your chicken wings from the slow cooker to a baking sheet. Bake the chicken wings for 15-20 minutes or until the skin crisps and dries and the wings are completely cooked. In a large bowl, whisk together the peanut butter, teriyaki sauce and hot sauce until they’re smooth. Dip each wing in the peanut sauce until it is fully coated. Sprinkle the tops of the wings with red pepper flakes for an added kick! For more delicious game-day recipes, please check out Yumology and follow us on Facebook, Twitter, Pinterest and Instagram. t Have a delicious day!